Why think of Dunkirk when Christmas is here? HMS Ark Royal is synonymous with the Royal Navy. The most famous ship to bear that name was the wartime aircraft carrier, launched in 1938, and torpedoed in 1941. In her short fighting career, Ark Royal achieved almost mythic status, given enormous publicity in the press, newsreels and feature films and, ironically in German propaganda as well. The ship earned her reputation. Ark Royal was the most modern purpose built aircraft carrier when she entered service, designed to carry five squadrons of Skua fighter bombers and Swordfish torpedo bombers over enormous distances. In her first year of operations her aircraft, carried out countless air patrols over Norway, dive bombed the German battle cruiser Scharnhorst and took part in the hunt for the Graf Spee in the South Atlantic. Surviving several near misses from German aircraft, her crew were firmly convinced she was a lucky ship. After the fall of France Ark Royal became part of Force H in the Mediterranean, under the command of Admiral Sir James Somerville Her aircraft attacked the French Fleet at Mirs el Kebir, patrolled the Atlantic, escorted convoys to Malta and bombed targets in Italy. 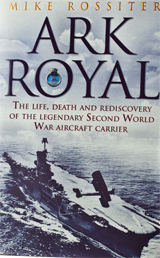 In May 1941, Ark Royal played the key role in one of Britain’s most famous naval battles. The Bismarck had left port and sailed into the Atlantic. She engaged and sank HMS Hood, the Navy’s flagship, and badly damaged the new battleship Prince of Wales. Ark Royal sailed into the Atlantic in the hunt to sink the Bismarck. Her Swordfish aircraft located the enemy ship, and in a ferocious storm launched a torpedo attack. Twelve of the slow biplanes, their cockpits open to the elements flew through a fearsome anti aircraft barrage and crippled the German warship. Out of control, unable to steer, Bismarck was sunk the next morning. This decisive victory resounded around the world, giving a dramatic boost to British morale and prestige. Ark Royal continued escorting vital convoys to Malta, but a few months later a German submarine, U-81 fired a salvo of three torpedoes at the Ark as she returned to Gibraltar. One of them found its target, tearing a huge hole in the Ark Royal’s hull. Several hours later the carrier, the Navy’s most famous, and glamorous vessel turned over and sank. Sixty years later, I started to search for the wreck. Using the most modern underwater technology, and the one of the worlds largest super yachts MY Octopus, I found and filmed the wreck. What I discovered raised questions about the official story of the Ark’s last days. Why was the wreck so hard to find, and did her commander Captain Maund deserve his court martial and reprimand? Discovery of the wreck did nothing to damage the reputation of the Ark Royal, or the courage of the men who served on her, many of whom told me their own stories of the short but action packed life of HMS Ark Royal. Buy the book from Amazon.